Do you remember your first Choose Your Own Adventure-style book? Mine was Escape from the Carnival of Horrors, part of the Give Yourself Goosebumps series. I went to a creepy fairgrounds and was eaten by a giant crocodile mutant. It was a bad day for my character, but a good day for me: I was enchanted by the idea of a book that let me participate in the story. 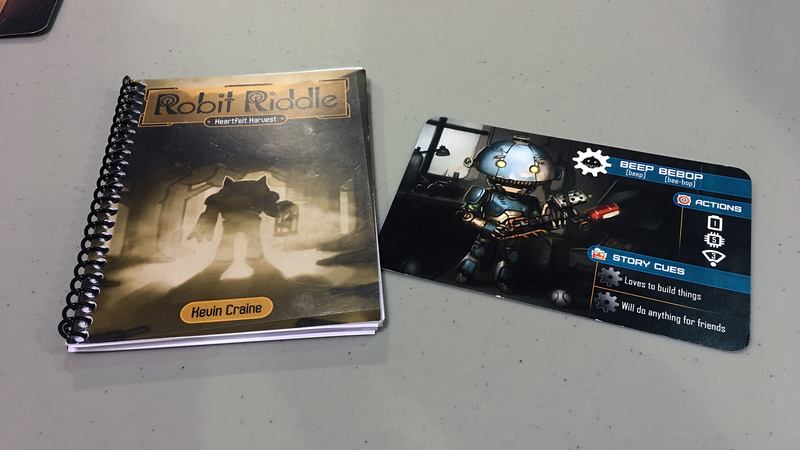 Kevin Craine of Baba Geek Games was inspired by Choose Your Own Adventure books and his two sons to create Robit Riddle. His older son loved to read, but didn’t relish coming up with his own stories. His younger son, by contrast, didn’t care for books, but was a natural storyteller. Robit Riddle bridged the gap between his boys’ interests. Games are played through Choose Your Own Adventure-style books. I mention bridging gaps not only because of the charming family story behind this game. Robit Riddle joins stat rolling, turn-based actions with role play. It also has the potential to bring both young and old to the table. There are not many role-playing games that are both accessible to kids and interesting enough to hold the attention of adults. If you’re a parent (or a geeky aunt or uncle), this just might be the game to introduce a kid in your life to the joys of Tabletop RPGs. Robit Riddle is set in a world inhabited by Robots of all shapes and sizes and their pets, the Robits. The game comes with a cast of playable characters with stats and unique personality traits that affect the game’s story. Also included are 3 storybooks, each with 20 endings. Gameplay is co-operative and the storybook is passed to the next player at the start of each turn, so everyone gets a turn to be the reader. The reader also has power to break ties if party is gridlocked when deciding on an action. The world of Robit Riddle features robots of all shapes and sizes. Each playable Robot has to roll dice to take actions like observing the environment, talk to other robots, making deductions, and fighting. It a roll fails, other players can spend a gear token from a communal pool use their abilities to assist. Each game can take 15-30 minutes. At the end of the game, the team of Robots receive a final score based on length of the story, number of characters encountered, and which of the endings they reached. Dice rolls determine if actions succeed, fail, or grant bonus gear tokens. For our demo of the game, I played as Pip Plink, a plucky-looking robot with the character attributes “Hunches are usually right” and “Always gets the story”. Our expedition to find our Robits led us to a cave full of slippery oil with a bossy dictionary bot. The storybook text is purposefully open-ended, which gives the players creative freedom. We were able to use our skills for role-play as well as action (for example, one character has a special ability to make very high jumps). The story ended on a beach, where we found an unfriendly robot who was throwing bombs into giant oil puddle. Our verbose friend from the cave was able to put the bomb-thrower to sleep. We rescued our adorable Robit cat and headed home for whatever the robot equivalent of cuddling is. Robit Riddle comes with a guide for tracking which endings have been discovered (handy for completionists), and there are already plans for an expansion set which will include 3 new storybooks. Some of the endings in these new books can only be unlocked by reaching certain endings in the base game. Baba Geek Games may also release games with similar mechanics in the future, sans Robots. 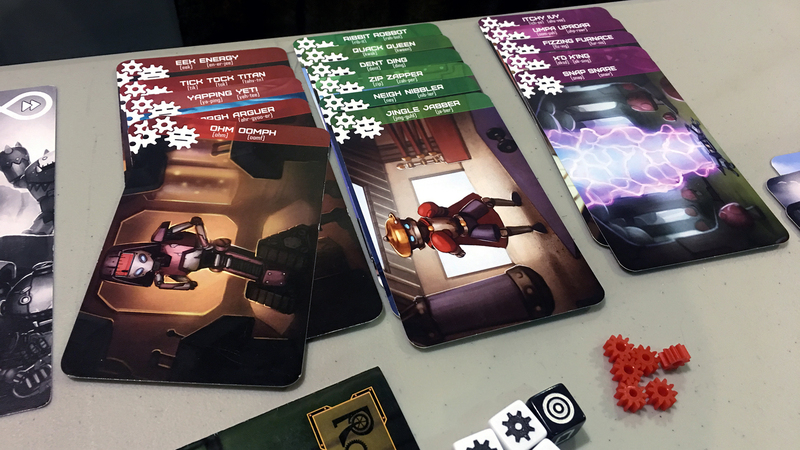 If you’re looking for a game that will appeal to a broad age range and doesn’t require tons of table space and hours of free time to play, check out Robit Riddle. The game is currently in print and can be pre-ordered. Units are expected to be shipped in February or March of 2018. 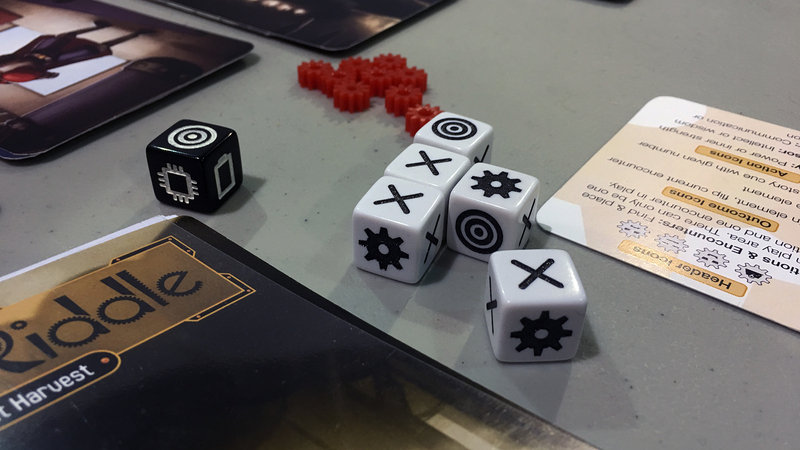 Follow @baba_geek on Twitter for news and updates, and check out more of our PAX Unplugged coverage here.